Like porcelain veneers and bonding, at Quali-Dent, both cosmetic crowns and bridges can now be made to look as real as natural teeth. Unlike removable devices such as dentures which you can take out and clean daily, crowns and bridges are attached permanently onto existing teeth or implants. At Quali-Dent, our philosophy is to be as non-invasive as possible, so we only suggest a crown when a tooth is too badly broken down to support bonding or a veneer or if a pre-existing crown is to be replaced. A crown can also be placed on top of an implant to provide you with a new replacement tooth. The porcelain used is similar to the material used for porcelain veneers, creating a life-like natural appearance. Quali-Dent may recommend a bridge if you’re missing one or more teeth to span the space where the teeth have been lost. This replacement is often necessary because gaps left by missing teeth may eventually cause the remaining teeth to rotate or shift into the empty spaces and can result in a host of problems, including a bad bite, gum disease and temporo mandibular joint (TMJ) disorders. 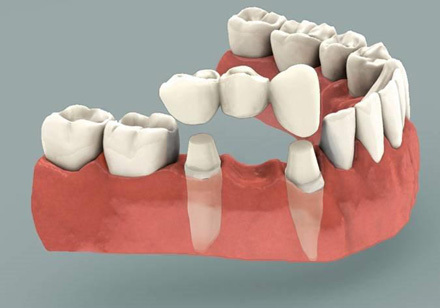 Bridges are cemented to the natural teeth or implants surrounding the empty space. Call Quali-Dent at 622-3777 to schedule a consultation and to find out if crowns and bridges are right for you.